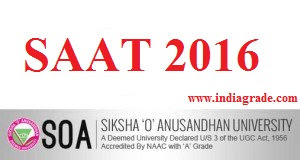 SAAT 2016 Application Form: Siksha O' Anusandhan University (SOA), Bhubaneshwar is going to conduct the SAAT Entrance Exam 2016 for the admission to various degree courses in UG Bachelor Degree Courses, PG Master Degree Courses, Dual Degree programmes and lateral entry programmes. Candidates are searching through the internet to know the details regarding the SAAT Application Form 2016. Siksha O' Anusandhan University Admission Test (SAAT) is national level entrance test which was conducted by the SOA University, Odisha every year for the admission of various degree courses in the field of Engineering, Medical, Dental, Pharmacy and Management. SAAT 2016 is the 8th edition and this entrance exam will going to conduct at 65 centers across 46 cities of India. Check below to know about clear information of SAAT Application Form 2016. Pass in Diploma in Engineering / Technology with less than 60% marks. Pass or appearing in 10+2 exam or equivalent with Physics, Chemistry, Biology (Botany and Zoology) and English and secured 50% marks. Age Limit: 17-25 years 31st December 2016. B.Pharm: Pass or appearing at 10+2 examination with Physics and Chemistry as compulsory. (OR) Pass in Diploma in Pharmacy with less than 60% marks. BHMCT / BSc Nursing: Pass or appearing at 10+2 examination with 45% (40% for SC/ST/OBC). Five years integrated BA LLB and BBA LLB: Pass or appearing the 10+2 or equivalent in any stream with 45% marks (40% for SC/ST/OBC). Pass or appearing in B.E / B Tech / AMIE / MCA / M.Sc in the respective discipline or equivalent form recognized university. GATE qualified candidates are exempted from the SAAT 2016 entrance test, but they have to submit the filled up application form. Pass or appearing three year UG Degree in any discipline from any recognized University with 50% of marks (45% for SC/ST/OBC). NOTE: For more details refer the official portal. Application Form & Information Brochure of SAAT 2016 Examination can be obtained by Person or by Post from the SOA University, Khandagiri Square, Bhubaneswar on the payment of Rupees Five Hundred in cash. SAAT Application Form 2016 can also be obtained from branches of Axis Bank and Punjab National Bank on payment of cash Rs.500. Candidates can apply online website and the payment of the SAAT 2016 online application fee done by using Debit Card / Credit Card. STEP I: First open the official web portal by clicking the link available below. STEP II: Complete the registration by details such as Name, Date of Birth, Email and Mobile Number. STEP III: You will receive One Time Password (OTP) through the Mobile Number and Email ID. STEP IV: Enter the One Time Password (OTP) and proceed the SAAT 2016 online application form. STEP V: Fill the SAAT 2016 Application Form carefully without any error. STEP VI: Then do the payment by Credit or Debit Card. STEP VII: Download and take printout of the Application Form for future use.